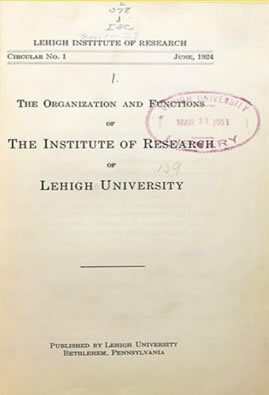 The Organization and Functions of the Institute of Research of Lehigh University. (Circular / Lehigh University. Institute of Research; no. 1) Bethlehem (Pa.), 1924. 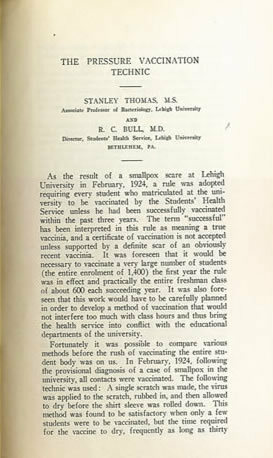 The Institute of Research was organized by an act of the Board of Trustees on April 25th, 1924. It was organized to encourage and promote scientific research and scholarly achievement in every division of learning represented at Lehigh University. In addition to the meetings and lecture series, the Institute also published a "Circular". Stanley Thomas and Raymond Cooley Bull. 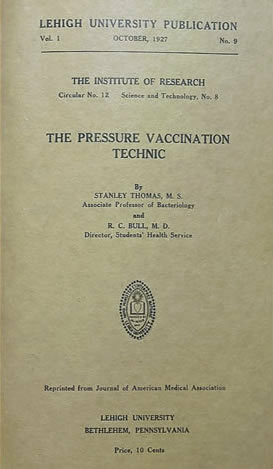 The Pressure Vaccination Technic. (Circular / Lehigh University. Institute of Research; no. 12) Bethlehem (Pa.), 1927. The Circular was published in order to preserve the records of the Institute of Research's work and make them available to everyone interested. Occasionally these bulletins were published by or presented before the professional societies. This issue of the Circular first appeared in Journal of American Medical Association.